Researchers are several steps closer to finding Homer's Ithaca, thanks to new results released today from geologic tests that support the hypothesis that the ancient kingdom of Ithaca may in fact be on western Kefalonia, not the modern-day Greek island of Ithaki, as has been suggested for several centuries, and is reported this month in Geotimes. The hypothesis  put forth by businessman Robert Bittlestone, classicist James Diggle and geologist John Underhill in their 2005 book Odysseus Unbound  suggests that a channel once separated Kefalonia from its western peninsula, called Paliki, creating two separate islands. Paliki is Ithaca, as described in the Bronze Age 3,200 years ago, according to the hypothesis. 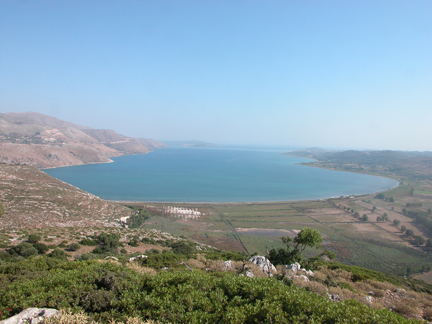 Some researchers are suggesting that the valley that separates Kefalonia from its western peninsula Paliki, shown here, may have once been a marine channel that created two separate islands. Now, geologic evidence is helping to uncover the buried marine channel, which adds credence to the hypothesis that Paliki may be the site of ancient Ithaca as described in the Odyssey. Image courtesy of John Underhill. The problem is that today, the "channel" is actually a shallow valley that rises to 180 meters above sea level. It is hard to fathom a situation in which geologic forces could have uplifted the land that much in just three millennia. And in fact, though earthquakes have uplifted the land several meters, tectonic forces cannot account for valley's elevation, says Underhill, of the University of Edinburgh. Instead, the researchers suggest that the valley filled in with rubble from landslides and debris flows caused by catastrophic rockfalls and earthquakes. Thus far, the results of all of the geologic, geomorphic and geophysical tests that Underhill and his international team have undertaken have been "very encouraging" for the hypothesis, Underhill says. After mapping the surface geology and running gravity surveys to model the subsurface  the results of which showed that landslides and rockfalls "are dominant processes in the area," Underhill says  in October 2006, the team drilled a borehole 122 meters deep into the valley. At that depth, 15 meters below present-day sea level, the team still did not hit bedrock, which would have nullified the infill hypothesis immediately. But the question remained if the borehole sediments were young enough to account for the infill. If they were 5,000 years old or older, the hypothesis would also be nullified. Last October, the team drilled 122 meters deep into the valley to see if they would encounter bedrock, and to to determine the depth to which Holocene landslide material occurs. The results do not disprove the hypothesis that a channel, now buried, once existed there: They did not encounter bedrock, and new dates from marine fossils within the reworked sediments indicate that the material is very young. Photograph is courtesy of John Underhill. The results of the dating of microscopic marine fossils in the borehole sediments, released today, show that the top 40 meters of the borehole are all "very young, reworked, slumped landslide material  it's all infilled material," Underhill says. Although the team doesn't have exact dates, the material is young enough to support the hypothesis, he says. 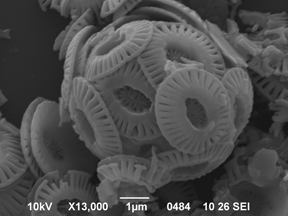 Microscopic marine fossils caught up in the sediments are consistent with the impact of a catastrophic landslide on a marine channel, which would have ejected a large volume of water out of the channel and saturated the infill material, the team said in a press statement. It's the most exciting news yet, Underhill says. Previous results have also confirmed the possibility that this valley was once a channel: Data acquired during an undersea seismic survey have shown what looks to be a buried channel exactly where it would be expected, and analysis of sea level rise and fall in the region matches the timing of valley's submergence and relative uplift. Researchers dated microscopic marine fossils called Emiliania huxleyi that were recovered within young reworked sediments in upper 40 meters of the borehole. The find further supports the infill hypothesis. Image is courtesy of the Bulgarian Aacademy of Sciences. "The results of [these] latest tests are very encouraging; they have given us the confidence to move forward with the next stage of major geological diagnostics," Bittlestone said in the statement. 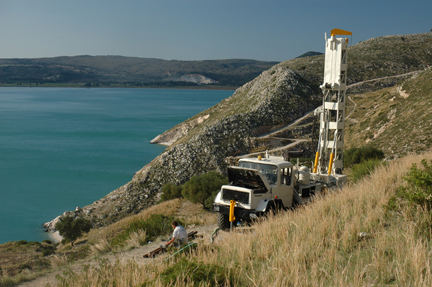 This summer, the team hopes to return to Greece to drill further. They hope to deepen the current borehole to however deep it takes to hit bedrock, Underhill says, as well as to shoot land-based seismic data along the whole length of the valley to get a better profile of the subsurface and then drill more boreholes in other locations to further test the hypothesis. "You know, I keep expecting to refute this theory, but at every turn the results come back positive," Underhill says. "So then it's onto the next geologic test." Eventually though, given the sheer volume of the circumstantial evidence that just keeps adding up, the Ithaca of Odysseus as described in Homer's epic poem the Odyssey may indeed be considered found, according to Underhill and the team. For much more on this research, see the story this month. And for fun, tell us what you think of the research in our poll.